Judith Arlene Resnik (/ˈrɛznɪk/; April 5, 1949 – January 28, 1986) was an American electrical engineer, software engineer, biomedical engineer, pilot and NASA astronaut who died when the Space Shuttle Challenger was destroyed during the launch of mission STS-51-L. Resnik was the second American woman in space and the fourth woman in space worldwide, logging 145 hours in orbit. She was also the first Jewish American in space and the first Jewish woman of any nationality in space. The IEEE Judith Resnik Award for space engineering is named in her honor. Carnegie Mellon University, B.S. University of Maryland, PhD. Initially planning to be a concert pianist, Resnik turned down a place at the Juilliard School of Music, choosing instead to study at Carnegie Mellon University after being 1 of only 16 women in the history of the United States to have attained a perfect score on the SAT exam at the time. She went on to graduate with a degree in electrical engineering from Carnegie Mellon before attaining a Ph.D. in electrical engineering from the University of Maryland. Recognised while still a child for her "intellectual brilliance", Resnik went on to work for RCA as an engineer on NASA missile and radar projects, was a senior systems engineer for Xerox Corporation and published research on special purpose integrated circuitry before she was recruited by NASA to the astronaut program as a mission specialist at age 28. While training on the astronaut program, she developed software and operating procedures for NASA missions. She was also a pilot and made research contributions to biomedical engineering as a research fellow of biomedical engineering at the National Institutes of Health. Resnik was born in 1949 to Sarah and Marvin, an optometrist, in Akron, Ohio. Her father was fluent in eight languages and served in the Army in military intelligence and aerial reconnaissance during World War II in the Pacific Theater. Both her parents were Jewish immigrants originally from Ukraine, (her father having immigrated via Israel). She grew up in an observant Jewish home in a family of rabbinical descent, studying at Hebrew school every weekend and celebrating her Bat Mitzvah. Her parents divorced while she was a teenager; in response, she prepared and filed a court case so that her custody could be switched from her mother to her father, with whom she was particularly close. Resnik was noticed for "intellectual brilliance" while still in kindergarten and entered elementary school a year early. At Firestone High School, she was an outstanding student, excelling in mathematics, languages and classical piano. She graduated as valedictorian and runner-up homecoming queen. Playing classical piano with "more than technical mastery", she planned on becoming a professional concert pianist. When questioned about her intensity at the piano, she replied, "I never play anything softly". Before college, she attained a perfect score on her SAT exam, the only woman in the country to do so that year and one of only 16 women at that time to ever have done so. Resnik received a place at the Juilliard School to study classical piano, but after receiving offers from universities across the country, she chose instead to study mathematics at Carnegie Mellon University. She entered Carnegie Mellon at age 17 and was one of few female students at the school. In her second year at Carnegie Tech, she developed a passion for electrical engineering, discovering her interest in "practical aspects of science" after attending lectures with her boyfriend and future husband, Michael Oldak, who was on the engineering course. Oldak said, “She was a math whiz, but at some point math lost the numbers and she wanted something more tangible so she switched her collegiate major to electrical engineering”. She earned a B.S. degree in electrical engineering in 1970. Her mentor and advisor was the dean of the Carnegie Mellon College of Engineering, Professor Angel G. Jordan. In 1977 she earned a Ph.D. in electrical engineering with honors at the University of Maryland. Upon graduation from Carnegie Mellon, Resnik worked at RCA as a design engineer in missile and radar projects and won the Graduate Study Program Award. She performed circuit design for the missile and surface radar division. While at RCA, she worked for NASA building custom integrated circuitry for the phased-array radar control systems and developed electronics and software for NASA's sounding rocket and telemetry systems programs. An academic paper she wrote on special purpose integrated circuitry caught the attention of NASA during this time. In 1977, Resnik qualified as a professional aircraft pilot while completing her Ph.D., having achieved near perfect scores in her flying exams (two 100s and a 98). After joining NASA, she piloted the Northrop T-38 Talon. 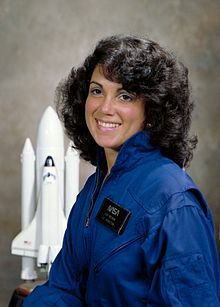 Astronaut Jerome Apt described her as “an excellent pilot and a superb operator in space”..
Judith Resnik as mission specialist onboard Space Shuttle Discovery in 1984. While working on her doctorate, Resnik also worked as a research fellow of biomedical engineering at the Laboratory of Neurophysiology at the National Institutes of Health. As a biomedical engineer, Resnik researched the physiology of visual systems. An academic article she published in 1978 concerned the biomedical engineering of optometry ("A novel rapid scanning microspectrophotometer and its use in measuring rhodopsin photoproduct pathways and kinetics in frog retinas"). She was a senior systems engineer for Xerox Corporation in product development. In January 1978, Resnik was recruited at age 28 into the NASA Astronaut Corps, one of six women selected out of 8000 applicants. The program to find women astronauts was developed by actress Nichelle Nichols, who volunteered her time. Her mentor and advisor, Professor Angel G. Jordan, then Dean of Carnegie Mellon College of Engineering and later provost of Carnegie Mellon, encouraged Resnik to apply for the program. Jordan later regretted doing so, saying 25 years after the Challenger disaster, “She was an amazing person... I pushed her to excel, and I live with that memory every day." On joining NASA's astronaut program, Resnik trained intensely and with great determination, focusing particularly on her physical fitness. She was deeply disappointed when she didn't become the first American woman in space. During training, it was assumed that either Resnik or Sally Ride would become the first woman in space, as they were the only female trainees receiving "the sorts of technical assignments which really prepared them for flight", such as RMS work and CAPCOM duties. The mission insignia of flight STS-41-D, the maiden voyage of Space Shuttle Discovery. Resnik's first space flight was on the maiden voyage of Discovery from August to September 1984 as a mission specialist. Her duties included operating the shuttle's robotic arm, which she helped create and on which she was an expert. She deployed and conducted experiments on a solar array wing as a potential future way of generating additional electrical power during space missions. After performing numerous dynamic tests, Resnik concluded that the experiment was very well-behaved and matched ground simulations of the array. She advocated the benefits of the solar array technology, particularly for future use in powering space stations. During the mission, Resnik held a written sign saying "Hi Dad" to the cameras, and in a live televised broadcast from space with President Reagan told him, "The Earth looks great". When Reagan asked her if the flight was all she hoped it would be, she replied, "It certainly is and I couldn't have picked a better crew to fly with." 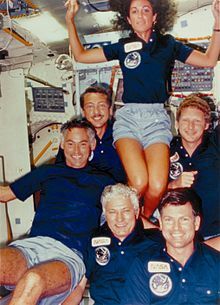 Henry Hartsfield described Resnik as the "astronaut's astronaut" after the mission, while Mike Mullane wrote, "I was also happy to be crewed with Judy... She was smart, hardworking, and dependable, all the things you would want in a fellow crewmember." While undergoing the intensive training of the NASA astronaut program, Resnik worked for NASA on research into the principle of orbital systems, flight software and the development of systems of manual control of spacecraft. She developed the software and operating procedures for the Remote Manipulation System for NASA. In addition, she developed the deployment systems for the tethered satellite system as well as working on orbiter development and creating experimental software for NASA to use on its missions. Resnik was the second American woman in space, after Sally Ride, and fourth overall. She was also the first American Jewish astronaut to go into space, the first Jewish woman and at the time only the second Jew to go to space (after Boris Volynov of the Soviet Union). Resnik was a mission specialist aboard Challenger for flight STS-51-L. Her last recorded words aboard Challenger regarded scanning for "LVLH" (low-vertical/low-horizontal), reminding the cockpit crew of a switch configuration change. This is the only evidence available that shows Onizuka and Resnik were alive after the cockpit separated from the vehicle. If the cabin had lost pressure, the air packs alone would not have sustained the crew during the two-minute descent. Resnik's was the first body to be recovered from the crashed vehicle cockpit by Navy divers of the USS Preserver. In 1970, Resnik married Michael Oldak, a fellow engineering student at Carnegie Mellon. They divorced in 1975 and remained on good terms. While at university, Resnik was a member of Tau Beta Pi and Alpha Epsilon Phi. She was a gourmet cook and a navigator in sports car rallies, in which she took part many times with her boyfriend. Resnik on the middeck of Discovery during STS-41-D, with a "I love Tom Selleck" sticker on her locker. The Resnik lunar crater on the Moon. Resnik has been awarded multiple posthumous honors and honored with landmarks and buildings being named for her, including a lunar crater Resnik located within the Apollo impact basin on the far side of the Moon; a dormitory at her alma mater, Carnegie Mellon; the main engineering lecture hall at the University of Maryland; Judith A. Resnik Elementary School in Gaithersburg, Maryland; Judith Resnik Community Learning Center in her hometown of Akron, Ohio; and Judith A. Resnik Middle School, established in 2016, in San Antonio, Texas. A memorial to her and the rest of the crew of Challenger was dedicated in Seabrook, Texas, where Resnik lived while stationed at the Johnson Space Center. The IEEE Judith A. Resnik Award was established in 1986 by the Institute of Electrical and Electronics Engineers and is presented annually to an individual or team in recognition of outstanding contributions to space engineering in areas of relevance to the IEEE. The Society of Women Engineers (SWE) awards the Resnik Challenger Medal annually to a woman who has changed the space industry, has personally contributed innovative technology verified by flight experience and will be recognized through future decades as having created milestones in the development of space as a resource for all humankind. The Challenger Center was established in 1986 by the families of the Challenger crew, including Resnik's brother, Charles Resnik MD, in honor of the crew members. The goal of the center is to increase STEM interest in children. On February 23, 1990, Resnik was named one of ten finalists to represent Ohio in the National Statuary Hall in the U.S. Capitol in Washington, D.C.
Resnik has been portrayed in works of nonfiction and fiction, including the 1990 made for TV movie Challenger, where Julie Fulton portrayed her. Resnik features prominently in Mike Mullane's 2006 book on the space program, Riding Rockets, which recalls Resnik's time in the NASA Astronaut Corps. Mullane was a colleague of Resnik and fellow crewmember on Discovery. ^ "Remembering the Challenger". The Ohio Historical Society Collections Blog. Archived from the original on 2016-01-05. ^ UPI staff (4 February 1986). "Resnik was `living out a dream`". The Milwaukee Journal. UPI. Part 2 Page 5. Retrieved 3 July 2013. Both got engineering jobs with RCA Corp. in Morristown N.J.
^ Renner, Lisanne (29 January 1986). "Coverage from the day space shuttle Challenger exploded: Resnik liked a job label with no frills". Orlando Sentinel. Retrieved 3 July 2013. Resnik didn't earn her pilot's license, the first step toward becoming an astronaut, until she left the National Institutes of Health in 1977 and took a job as a senior systems engineer with Xerox Corp. in El Segundo, Calif.
^ "Nichelle Nichols, NASA Recruiter". NASA. Archived from the original on 2009-12-22. Retrieved 2019-01-09. From the late 1970's until the late 1980's, NASA employed Nichelle Nichols to recruit new astronaut candidates. Many of her new recruits were women or members of racial and ethnic minorities, including Guion Bluford (the first African-American astronaut), Sally Ride (the first female American astronaut), Judith Resnik (one of the original set of female astronauts, who perished during the launch of the Challenger on January 28, 1986), and Ronald McNair (the second African-American astronaut, and another victim of the Challenger accident). ^ Arcynta Ali Childs (2011-06-11). "Q & A: Nichelle Nichols, AKA Lt. Uhura, and NASA". Smithsonian.com. Retrieved 2019-01-09. Ten years after "Star Trek" was cancelled, almost to the day, I was invited to join the board of directors of the newly formed National Space Society. They flew me to Washington and I gave a speech called “New Opportunities for the Humanization of Space” or “Space, What’s in it for me?” In [the speech], I’m going where no man or woman dares go. I took NASA on for not including women and I gave some history of the powerful women who had applied and, after five times applying, felt disenfranchised and backed off. [At that time] NASA was having their fifth or sixth recruitment and women and ethnic people [were] staying away in droves. I was asked to come to headquarters the next day and they wanted me to assist them in persuading women and people of ethnic backgrounds that NASA was serious [about recruiting them]. And I said you’ve got to be joking; I didn’t take them seriously. . . . John Yardley, who I knew from working on a previous project, was in the room and said 'Nichelle, we are serious.' I said OK. I will do this and I will bring you the most qualified people on the planet, as qualified as anyone you’ve ever had and I will bring them in droves. And if you do not pick a person of color, if you do not pick a woman, if it’s the same old, same old, all-white male astronaut corps, that you’ve done for the last five years, and I’m just another dupe, I will be your worst nightmare. ^ Wade, Mark. "Resnik". Archived from the original on 2009-10-08. Retrieved 2009-11-21. ^ "Judith Resnik". Jewish Women's Archive. Retrieved 2009-11-20. ^ "Biographical Data - Judith A. Resnick". National Aeronautics and Space Administration. December 2003. ^ "The 51-L Crew: Judy Resnick". The Challenger Center. Archived from the original on 2012-07-06. ^ "Remarks of Senator John Glenn, Memorial Service For Judith Resnik". National Aeronautics and Space Administration. 1986-02-03. ^ "IEEE Judith A. Resnik Award". IEEE. Retrieved 2009-12-27. ^ "Resnik Challenger Medal". SWE. Retrieved 2017-03-24. ^ "Who We Are". Challenger.org. Retrieved January 15, 2018. ^ "Resnik, Charles - University of Maryland School of Medicine". MedSchool.UMaryland.edu. Retrieved January 15, 2018. ^ "Charles Resnik". Challenger.org. Retrieved January 15, 2018. ^ Jim Siegel (February 24, 2010). "10 Ohioans proposed to represent state in U.S. Capitol". The Columbus Dispatch. Archived from the original on February 26, 2010. Retrieved February 27, 2010. "Judith Resnik reference site". Archived from the original on 2007-06-06. Retrieved 2007-10-07.